Tsunami Strike! Caribbean Edition offers an interactive learning experience in which learners take on the role of a journalist writing an article for a news magazine. Sixteen multimedia lessons on tsunami science, safety, and history are interwoven within the learning scenario as resources for the article. 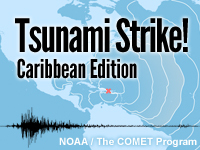 The material is aimed at middle school and high school students (ages 13-17) but will be useful to a broader audience wishing to learn more about tsunamis in general, and in particular about tsunami risks in the Caribbean. Students will have a basic knowledge of the earth's major plates and their locations, and understand why some faults zones are more likely to generate tsunamis. December 2017: Lesson updates reflect changes in the National Tsunami Warning Center and Pacific Tsunami Warning Center areas of responsibility, which directly affect part of the Caribbean region. May 2014: In October 2013, the West Coast/Alaska Tsunami Warning was renamed the National Tsunami Warning Center. This lesson currently reflects the previous name.